Decision-making skills are mission-critical in today's competitive environment, and a prerequisite for leadership advancement. Boost them with the Decision-Making Style Inventory (DMI). Identifies an individual's decision making style preference. Is an easy to administer, 20-item Likert assessment that takes only 10 minutes to complete and self score. Gives advice on style effectiveness, how to communicate successfully with other styles, and style flexibility. Can be applied in multiple areas, including leadership, career planning, communication, strategic planning, creativity, and innovation. The Facilitator's Guide offers everything you need to successfully administer the Decision Making Style Inventory. 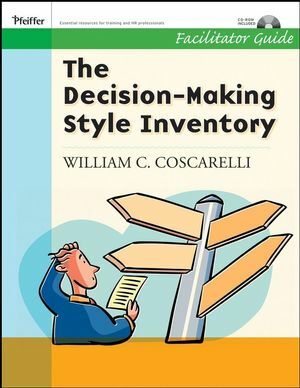 The Guide includes the inventory's complete technical data -- validation, correlation, and reliability statistics; a section devoted to decision making theory; advice on creating action plans for developing style flexibility; and a sample of both the Decision Making Inventory and the Participant's Workbook. William C. Coscarelli teaches fulltime at Southern Illinois University Carbondale in the department of Curriculum & Instruction. He is the former co-director of the Hewlett-Packard World Wide Test Development Center. He was elected as president of the Association for Educational Communications and Technology Division for Instructional Development, appointed as founding editor of Performance Improvement Quarterly, and was elected as the president of the ISPI (International Society for Performance Improvement). BACKGROUND FOR THE DECISION-MAKING STYLE INVENTORY AND WORKSHOP. INTRODUCTION TO THE FACILITATOR GUIDE. DEVELOPMENT OF THE DECISION-MAKING STYLE THEORY. DEVELOPMENT OF THE DECISION-MAKING STYLE INVENTORY. ABOUT THE DECISION-MAKING STYLE INVENTORY. ADMINISTERING AND SCORING THE INVENTORY. PREPARING FOR A WORKSHOP SESSION. CONDUCTING THE WORKSHOP: UNDERSTANDING UN-UNDERSTANDABLE PEOPLE. Implications of the Decision-Making Styles. Putting the Styles to Use. Appendix A: Description of the Workshop. Appendix B: Thumbnails of Slides. Appendix C: Instruction for Scoring the DMSI.